Here you will find compact guides that will aid you in using UiT's videoconference rooms. These guides are meant as an addition to the user guides printed on laminated support-cards placed in the rooms. See also Video conference start page for more info about booking. See also Video conference-rooms and IP-adresses for a complete list of rooms. 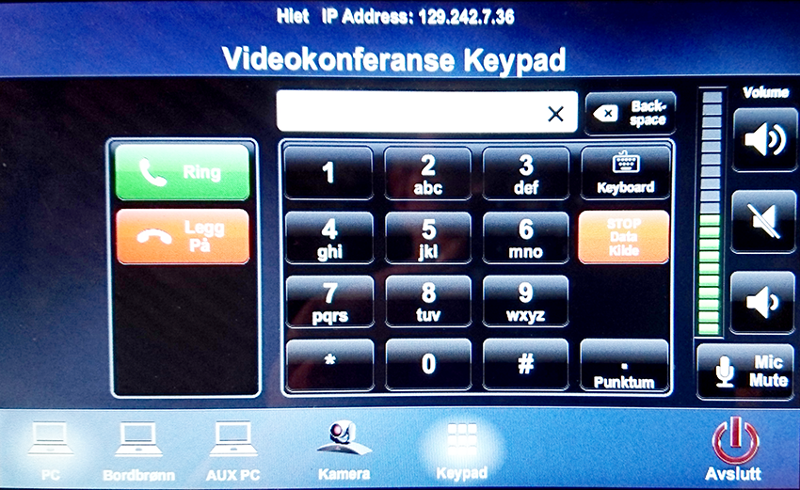 Place a direct call to another videoconference-room using IP-adresses. This is a 1-1 call, and you are using an IP-adress to call another room directly, and the other participants must answer using their video conference system. Place a call to a virtual meeting room. UiT currently runs about 10 of these cloud-based rooms, which serve as meetingrooms for many participants on different platforms. These platforms include dedicated video-conferencing equipment, webbrowsers on PC or Mac, Skype for Business, or other IP telephone systems. Applies to making calls to rooms that are registered on the list of UiT-rooms with IP-adresses and other video conference rooms that you have a known IP-adress for. The exact appearance of the Crestron control panel may vary somewhat from room to room. Press on the control panel > select Videokonferanse (Videoconference). English language is available on some of the panels, look for a British flag and press it to change languages. Screens, TV's, Smartboards and cameras will start up (depending on the room you're in). Type in the desired internal UiT IP adress (see the list). Making calls to external room require that you have obtained an IP-adress (see also "Placing calls to external videoconference-rooms using the control panel" below). Call by pressing the "Ring" ("Call") button. Adjust output audio volume in the room with the same control panel. Use mic mute and volume mute, found on the control panel main page (see picture above). Control camera placement with the "Kamera" ("Camera") menu button. Hang up your call with the "Legg på" ("Hang up") button. Use the IP-adress you have recieved. This method is used when the people you are calling is not registered within UiT's systems. Type in the IP adress into the control panel. Don't forget to put in periods. Press "Ring" ("Call") to place call. There are approximately 10 virtual meetingrooms at UiT, and most are associated with an actual conference room. If a room has an EasyNumber, you will find an unique 4-digit number located at the very bottom of the list over IP-adresses. These are handed out in all videoconference rooms at UiT. It is vital that all attendees have recieved the same EasyNumber in their meeting-requests. Now, anyone with the EasyNumber can use it to connect to the videoconference in different ways (more info follows below). This method is aimed at external attendees who wants to participate in a videoconference using their own PC and web browser, because they are otherwise lacking access to video conferencing equipment (due to travelling and so on). EasyConference recommends using Chrome web browser. Remember to connect your audio equipment/mic and camera first. Headsets with microphones built in will always provide superior sound quality, as opposed to the laptop's built-in audio solutions. Go to the web site join.easymeeting.net. Type in your name into the proper field. Type in the EasyNumber for the conference/room you are attending like this: 1234. Press "Connect", and then select correct mic and camera. Confirm with "Start" to enter. You can apply the same method using your cell phone and a phone browser. Please use WiFi, and not 4g/cellular internet connection - this could prove to be quite expensive! When you have recieved a meeting request to a video conference and a 4-digit EasyNumber, it is possible to call in and participate using Skype for Business. For more help with Skype for Business, see this web page. By using the same adress as mentioned in the Skype example above, you can place calls to UiT virtual meeting rooms, using a service of your choice. Not all services are known to Orakelet, so support will be very limited. Start your IP-teelphone service or software. Type in your EasyNumber + web adress like this: 1234@easymeeting.net, and place the call. Regular phone is also an option! Call the meeting using the number that fits your particular situation. Keep your EasyNumber at hand. While in a video conference call, you can share content from a computer with the other attendees. Please choose either PC (local stationary PC in the room), or a portable unit connected with the proper cables. With reference to the picture of the Control panel at the top of this page, please understand that "Bordbrønn" ("Table sink") refers to an unit connected to the system using the HDMI-cable. AUX PC refers to units connected with the VGA-cable. These labels and buttons will vary somewhat from room to room, and entails that all meeting hosts should come prepared. In the Control Panel, press the button associated with the source you wish to share. Share content as usual, i.e. just use your computer and show PPT's, documents etc. Press Stopp data kilde (Stop data source) to stop sharing. Go to the web page AVhelp for more short and consise user guides for lecturers and meeting hosts.